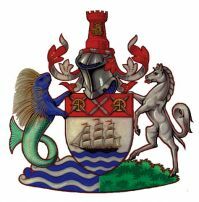 The Coat of Arms is the official symbol of the Borough of Gravesham - but it is more than that. The Arms of the Borough of Gravesham comprise six allusions that echo various aspects of the character and composition of the Borough. Following research by the college of Heralds into the heraldic elements of the past Arms of the various parts of the Borough area, a unique design has been produced and granted. The Shield consists of symbolic water on which an East Indiaman is in full sail, which refers to Northfleet and specifically to Pitchers Dockyard, where East Indiamen were built. It also introduces the idea of commerce and trade with the world, both in the past and in the present. At the top of the Shield on a broad red band, are placed the sails of a windmill, alluding to the rural areas of the borough. Crossed quill pens, to indicate the association with Charles Dickens, are interlaced through gold buckles inspired by the Arms of Gravesend which date from 1635. The Crest consists of the Tower from the Arms of Gravesend. The helm beneath is that appropriate to a Body Corporate, that is steel, visor closed and facing the viewer’s left. The mantling flowing from either side is Gules (red) lined with Argent (silver). The Supporter to the ‘dexter’ (right) is the white horse of Kent. To the ‘sinister’ (left) is a new heraldic mythical monster - a sea porcupine, inspired by the Arms of the Portreve of Gravesend. Beneath the Supporters is a compartment of symbolic water and green countryside, to allude to marine interests of the area as well as its agricultural purposes. These armorial Bearings were fully granted to the Borough on July 25th 1975. "Discover - Facts on Gravesend - Gravesham's Coat of Arms." Leaflet available from Towncentric.